I’m not sure if it is my age, gender or maybe it’s just my network but it seems like everywhere I turn babies are a topic of discussion. Many new parents are eager to share itty-bitty details about parenthood but less inclined to discuss how their new little addition has impacted their financial lives. As part of our NextWave program of financial education for young adults in their 20s and 30s, we have put together a checklist outlining some important financial elements that parents, or even grandparents, may wish to consider. 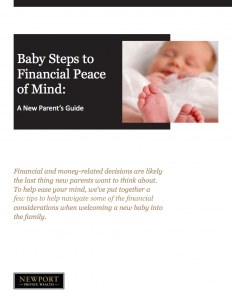 We hope that this guide will help simplify the financial process, allowing parents to focus on the day-to-day duties of caring for their new baby. Newport Private Wealth’s NextWave program is designed to help young adults navigate financial issues faced throughout their 20s and 30s.